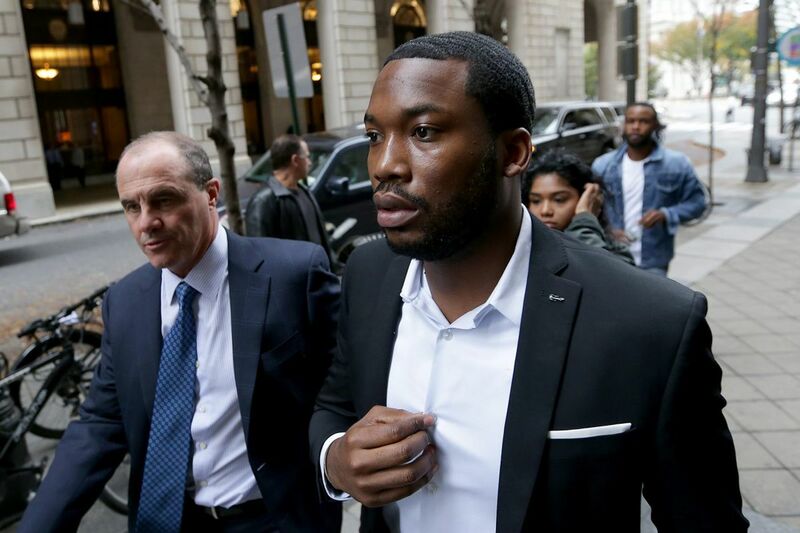 Rapper Meek Mill, right, arrives at the Criminal Justice Center with his lawyer, Brian McMonagle, on Nov. 6, 2017. Meek Mill, 19, whose birth name is Robert Rihmeek Williams, is arrested in Southwest Philadelphia on drug and weapons charges. In a trial before Common Pleas Court Judge Genece E. Brinkley, narcotics officer Reginald V. Graham testifies that he saw Mill sell crack cocaine and pull a gun from his waistband when officers approached. Mill admits having a gun but denies selling drugs or pointing a weapon at police. Brinkley convicts Mill of drug possession, firearms violations, and simple assault. Mill serves five months in jail. Dec. 17: At a hearing, Brinkley rules that Mill violated the terms of his probation by scheduling performances to promote his first CD, and forbids him from touring for a month. The ruling forces cancellations of concerts in Africa, the Caribbean, and across the United States. "Clearly this court has bent over backwards all these years," Brinkley says, referring to Mill's short six-month jail term. June 28: Brinkley orders Mill to attend etiquette classes to learn how to act in public and online, and to notify his probation officer when he wants to travel outside Pennsylvania. Mill tells the judge that it was difficult to detail his travel plans because many of his business activities are arranged on short notice. July 11: Brinkley sentences Mill to three to six months in prison for ignoring her order not to schedule any new concerts between July 1 and Aug. 11. "After all these years of me trying to help him move his career forward … I believe this defendant is basically thumbing his nose at me," Brinkley says. Aug. 18: Brinkley denies Mill early parole, saying she saw no signs he had changed his ways. "I'm not going to have him thumbing his nose at me every time I turn around," she says. Dec. 2: Mill is released from jail. Brinkley prohibits him from resuming concerts until he completes a plan of treatment and community service. March 21: Mill performs a "homecoming" concert at the Wells Fargo Center. Meek Mill performs at the Susquehanna Bank Center in Camden on Aug. 6, 2015. Dec. 14: At a 5½-hour probation hearing, Brinkley rules that Mill once again violated parole. She bars him from performing and limits his travel, saying: "I bent over backward to give him every opportunity to grow his career." Feb. 5: Brinkley sentences Mill to at least 90 days' house arrest. Aug. 17: Brinkley bars Mill from performing outside Philadelphia or Montgomery County. Nov. 4: Responding to cancellation of a Mill performance at Syracuse University, students mount a phone and email campaign seeking to convince Brinkley to let him perform. Nov. 6: Brinkley sentences Mill to two to four years in prison for repeatedly violating his probation, and orders him taken into custody immediately. "I gave you break after break, and you basically just thumbed your nose at this court," Brinkley tells Mill. Nov. 13: Hundreds of Mill supporters rally outside the Criminal Justice Center. Speakers include 76ers Hall of Famer Julius Erving, Eagles safety Malcolm Jenkins, and rappers Rick Ross and Freeway. Nov. 14: In a legal filing, Mill's lawyers ask Brinkley to disqualify herself from further involvement in his case and to let a new judge reconsider Mill's prison sentence. Buses with signs showing support for Meek Mill circled City Hall on Nov. 14, 2017. Nov. 16: "Stand With Meek Mill" ads appear on billboards and newsstands, and wrapped around SEPTA buses. The ads are paid by Jay-Z's management company and by Michael Rubin, an owner of the 76ers. Feb. 13: The Inquirer and Daily News report that the Philadelphia District Attorney's Office in 2017 secretly compiled a list of Philadelphia police officers with a history of lying, racial bias, or brutality in a move to block them from testifying in court. On the list was Reginald V. Graham, who arrested Mill in 2007. Prosecutors acknowledge that Mill's lawyers were never told of the list or that Graham was on it. Feb. 14: A former Philadelphia police officer accuses Graham of lying under oath in 2008 in an effort to put Mill in jail. March 23: Gov. Wolf tweets his support for Philadelphia District Attorney Larry Krasner's position on Mill. March 29: In a 48-page opinion, Brinkley writes that she "committed no error" in not recusing herself in Mill's case and that the prison sentence she imposed on him of two to four years "was not manifestly excessive." April 11: Mayor Kenney visits Meek Mill in prison. A Kenney spokeswoman says the mayor believes that Mill "would better serve the community outside of prison." April 16: The District Attorney's Office says Mill's conviction should be vacated and he should be granted a new trial, due to questions about the credibility of Graham. It is the first time that prosecutors have publicly said they agree with the claim by Mill's lawyers that his 2007 arrest might have been improper. Brinkley does not immediately vacate the conviction and refuses to hear arguments from Mill's attorneys that he should be let out on bail, scheduling another hearing for June. April 24: The Pennsylvania Supreme Court orders that Mill should be immediately released from prison on bail.